I used to constantly zip through St. Andrew, transferring onto the packed 504 King westbound streetcar, on my way to after-work climbing sessions at an industrial warehouse at Front and Bathurst. I knew exactly where to board onto a southbound train on the Yonge line, so that when I got off at St. Andrew, I’d wind up right by the platform escalator to the mezzanine. Then they tore my old gym down to make way for condos, and I stopped coming through St. Andrew. Though I miss the gym terribly, I’m glad I don’t have to travel that painful stretch from University to Spadina anymore—King St. traffic has markedly deteriorated. 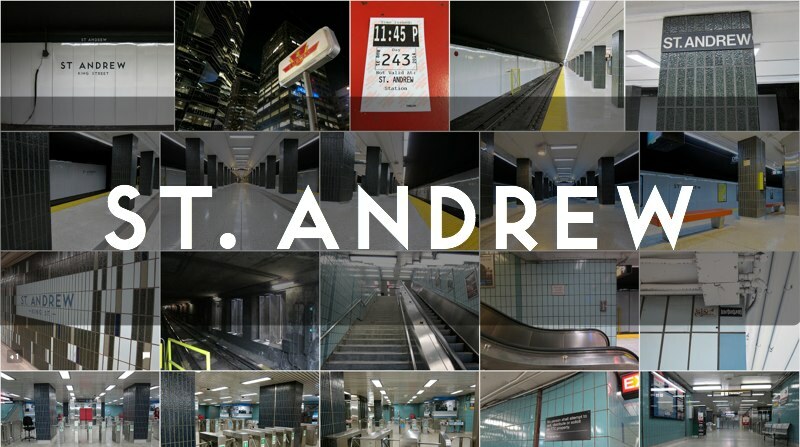 In recent years, St. Andrew was the subject of a number of lighting and tiling half-renovations, ostensibly for testing and data-gathering purposes. The result was that the station looked wretchedly dilapidated at the platform level. Thankfully, the powers that be finally decided to complete the station renovations (along with a long-awaited elevator addition). I applaud the serious, business-like result, entirely in keeping with the station’s Financial District proximity. The LED lighting and the shiny wall panels combine to create a crisp, ever-so-slightly bluish feel. Even better, the walls are largely unsullied by advertising, lending the station a certain purity of demeanour. I wouldn’t be surprised if the platform looks identical 50 years from now. Like the adjacent St. Andrew Presbyterian Church (built in 1876, located outside the southwest entrance), the station was named for the historical St. Andrew’s Ward, one of the city’s original five municipal wards. The station opened in 1963 as part of the University line. Underground PATH connections allow it to serve as an active daytime pedestrian conduit — the mezzanine level has an unpaid fare channel right down the middle from east to west.